So.. I'm going to try something new. I'm going to start including a "rating" for the "quality" of a deal - although just a heads up - this will be a personal rating, based on my own judgement. This is just to give you, the reader, a better idea of how good the deal you're about to read is. As a general rule of thumb, the more versatile a deal, the higher the rating. This means that just because you can get 90% off a Ferrari, saving you $500,000, I'm not going to rate this highly because there are realistic alternatives you could get, and it's too specific a deal that only appeals to a specific subset of people. Last Updated: 5 July 2018 - A friend of mine tried using this today and was told it has expired. Until next time.. Sorry I didn't give you guys much time to use this deal! GrabPay - yet another "QR Code" payment app. Not that I'm complaining, because it means more competition, and more competition tends to mean more promotions/discounts/deals. Here's one for those who feel like a sandwich. Use GrabPay to pay for your 6" sub and get 33% off! No explicitly stated expiry date. Here's a photo I managed to snap of the menu. 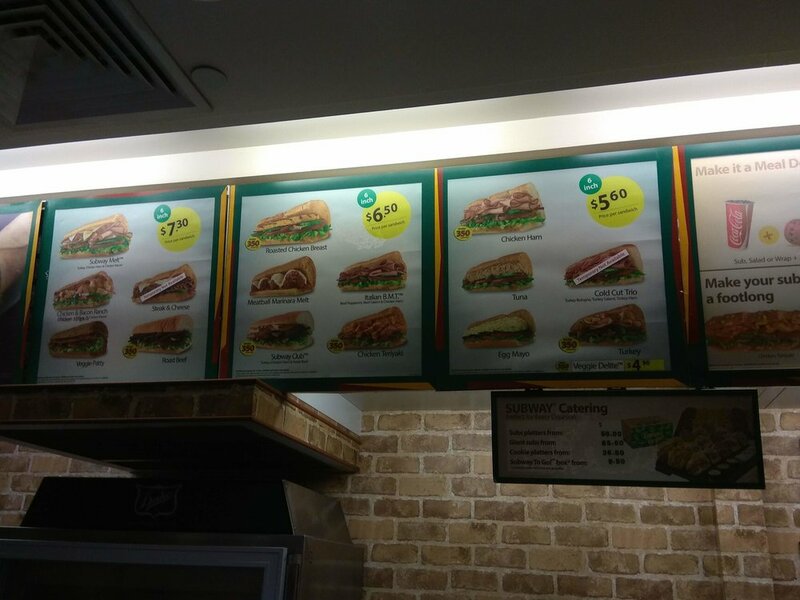 I'm not sure if prices are uniform across all stores in Singapore. I walked in and contemplated ordering one, but then I thought, I could get mixed rice from the Hawker center down the road for the same price and get a fairly good mix of meat + veggie at a reasonable size. I still find a 6" to be a tad too small. However, if you're really after a sandwich, it's definitely not a bad deal! I haven't used GrabPay yet so I can't comment on how easy it is to use yet, but I do know you need to "top up" your GrabPay wallet with money first (min top up $10). That concludes my short but sweet deal for the week!